I've started out my last few days of sewing by assembling a finished row of my Dear Jane quilt and adding it to the rest. It really has set my mind at ease about how it is going to look when it's all together, it's going to be beautiful! I love adding the sashing strips to each block and pressing them (and petting them). They are indeed so tiny and perfect and well worth the effort and time I have spent so far! Today I will add row F and then all my complete rows will be sewn together. I only have 4 blocks done in row G, so that should take me through the rest of the month to finish and add to the rest, at that point I will officially have over half the center together. My goal is to add two rows each month. If I have extra time I will work on the triangles and cut the solid wedges for the outer border. Keeping up at this pace should should see the top done by the end of June! Then comes the quilting. I'm excited to see a finish in the foreseeable future on this very long term project! 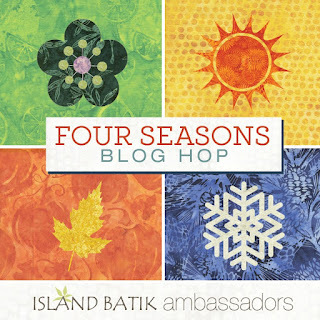 Don't forget about the Four Seasons Blog Hop from Island Batik. Yesterday I was asked if all the giveaways are through Facebook. 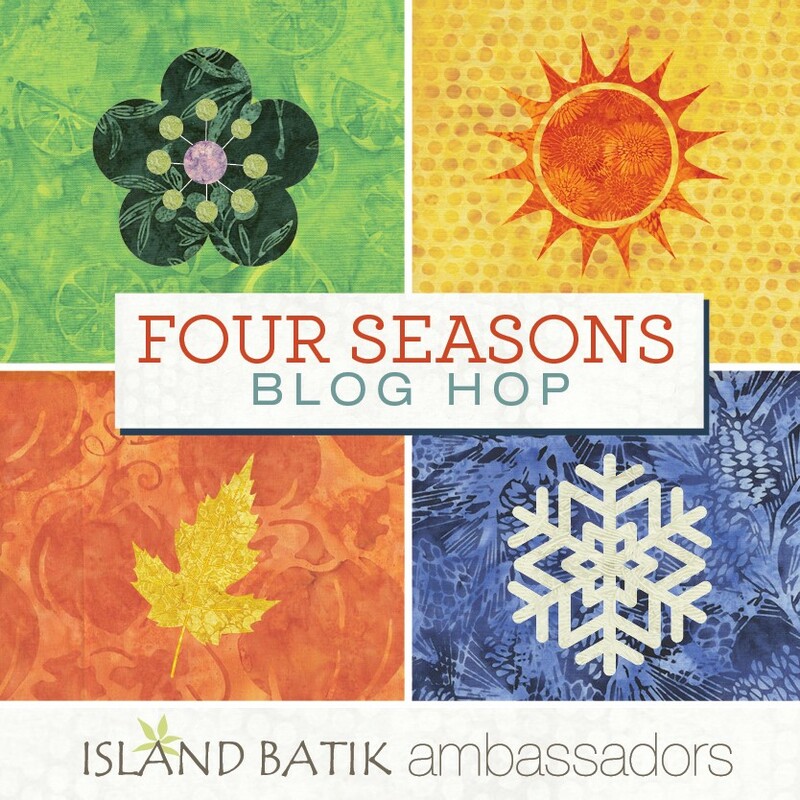 Yes, the main one from Island Batik is, but each blog is also having an individual giveaway on their hop day and most of those are just commenting on the blog post, so you can do that even if you don't have a facebook page. Make sure you read the instructions, some of the giveaways are US only. We try to accommodate as many people as we can, but shipping is expensive overseas. Today's posts feature the Mountain's Majesty line - so pretty! Thanks for visiting my blog - hope you enjoy the bog hop! Linking up with Connie for Linky Tuesday. That's looking great so far. Glad you have a workable plan now. Keep it up! Beautiful blocks! I also have a giveaway on my blog for my Island Batik project.